How the FIRST GENERATION night vision devices work? A Night Vision Device can be a 1 st , 2 nd , 3 rd generation unit. What this stands for, is what type of light intensifier tube is used for that particular device the light intensifier tube is the heart and soul of a night vision device. The 1st generation is currently the most popular type of night vision in the world. Utilizing the basic principles described earlier, a 1st generation will amplify the existing light several thousand times letting you clearly see in the dark. These units provide a bright and sharp image at a low cost, which is perfect, whether you are boating, observing wildlife, or providing security for your home. You may notice the following when you are looking through a 1st generation unit . The image you see may be slightly blurry around the edges. When you turn a 1st gen off it may glow green for some time. How the Second GENERATION night vision devices work ? The 2nd generation is primarily used by law enforcement or for professional applications. This is because the cost of a 2nd gen unit is approximately $500.00 to $1000.00 more then a 1st gen. The main difference between a 1st and a 2ndgeneration unit is the addition of a micro-channel plate, commonly referred to as a MCP. The MCP works as an electron amplifier and is placed directly behind the photocathode. The MCP consists of millions of short parallel glass tubes. When the electrons pass through these short tubes, thousands more electrons are released. This extra process allows 2nd generation units to amplify the light many more times then 1st generation giving you a brighter and sharper image. How the THIRD GENERATION night vision devices work? The 3rd generation is operating with special chemicals, gallium arsenide to the photocathode. The brighter and sharper image is the major characteristics of a 3 rd generation. AnGE ion barrier film was also added to increase tube life. Gen. 3 provides the user with excellent light performance. The Gen 3 technology improves night operational effectiveness for military users of night vision goggles and other night vision devices. The filmless MCP provides a higher signal-to-noise ratio than Gen 3, resulting in better image quality (less scintillation) under low-light conditions. The gated power supply further improves image resolution under high light conditions, and the reduced halo minimizes interference from bright light sources. These improvements also substantially increase the detection range of the systems. This quick guide will help you understand the differences in image intensifier tube clarity and performance within the different quality levels of night vision. Image tubes are the high tech part of a device and there is great variation in image tube quality. Clarity refers to the size and amount of blemishes or imperfections (black specks) you will see that are inherent in all image tubes. The performance refers to how well the optic will see in low light, this is distance and brightness. Note that different manufacturers refer to these quality levels with different abbreviations and that each manufacturer has their own criteria for grading their tubes. This guide is only a general outline and image tube quality can even vary from month to month based on image tube availability. Remember image intensifier tubes are unique like diamonds in that no two are the same. For the most accurate and current info on what products are best, give us a call and we can recommend the best products for your budget. Here at Nightvision4less we are sort of night vision geeks and between our being one of the largest dealers and our passion for optics, we can give you the inside scoop on the best gear to buy. Most Gen 1 equipment uses similar technology and thus image tube performance does not vary too much between similar Gen 1 products. What does make a performance difference in Gen 1 products is the quality of the lenses, the controls, and the devices’ design. This is base quality Gen 2 that is a huge step up from Gen 1. Comparing base level Gen 2 to Gen 1 would be like comparing a motorcycle to a bicycle – they both have 2 wheels but that’s about it. These image tubes will have more imperfections and lower performance than higher level Gen 2 gear. These are known as standard Gen 2 or standard tube. This level of Gen 2 is a good choice as they are cleaner and generally perform better than base Gen 2 but usually don't cost much more for the increase in quality. These are sometimes referred to as custom grade tubes or mil-spec grade. This is extremely good Gen 2 equipment. Big step up from the two lower grades of Gen 2 in performance, getting very close to Generation 3 performance. However the price of this high level of Generation 2 gets very close to some Gen 3 and with the much longer life expectancy of Gen 3 image tubes, the Generation 3 is often the better choice. This Gen 2 grade is called high performance tube or just high performance. This gets you the real deal, Gen 3. These will usually have more imperfections/blemishes and lesser performance than the higher levels of Gen 3 however they still give great overall performance and will last you about 10,000 hours plus, which is much longer than the lower generations. These Gen 3ST image tubes are technically at the same grade level as Gen 3. However from what we have seen of these image tubes is that they tend to be a bit nicer in terms of less belmishes. These tubes are a great buy for low cost Gen 3 when available. The only problem is, they are not autogated/pinnacle tubes. This is a better grade than standard gen 3. The image tubes will typically be clearer and they will usually come with image tube data test sheets (detailed test data on each image tube). These tubes are like Gen 3A tubes except that they have autogated power supplies. They allow for vastly superior performance in light polluted areas. This grade/type of image tubes is what's currently used by our US military and special forces. These are what we prefer to use as they work great in all lighting conditions, including dusk and dawn. These tubes are often referred to as Pinnacle or Autogated. HS is our abbreviation for hand selected image tubes. This is an option that you will see on some of our Generation 3 equipment. 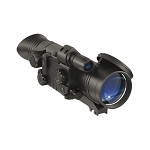 This is the absolute best in night vision equipment performance. Our hand select quality image tubes have a minimum Signal to Noise Ratio of 27 or higher and extremely good clarity. The Signal to Noise Ratio is the best indicator of how well the device will see in low light and the higher the number is the better. Less than 5% of Gen 3 image tubes meet our strict hand selected standards. These tubes are stronger and clearer giving you better performance in low light, which in turn gives you longer distance capability. If you are looking for the absolute best performance possible our Hand Select image tubes are it. How far can I see at night? What’s the difference between night vision and thermal? What is Manual Gain Adjustment? Why don’t you sell “generation 4” and what are “filmless” generation 3 tubes? What are White Phosphor tubes and is the black and white image better than the traditional green color? Why do I need an Infrared Illuminator? There are many variables to consider that can affect visible distance with a Night Vision device. First, what are you trying to see? The larger the object the easier it is to see. What are the lighting conditions? The more ambient light you have, the more you will be able to see. You can always see further under moon and/or starlight. Generally, you should be able to tell the difference between male & female figures at around 75-100 yards. Remember – Night Vision Technology is meant to help you see in the dark, but not necessarily long distances like with binoculars. Night Vision operates on the principle of light amplification; Thermal Imaging is a technology that creates a photographic image or video sequence of light emitted by an object at terrestrial temperatures (Heat Signature). Auto-Gating constantly operates to improve the quality of the image, not only during day-night-day transition, but also under dynamic lighting conditions. Some of the scopes you will for sale on our website feature Manual Gain Adjustment. This control knob basically gives the user the ability to increase the “gain” or electronic amplification of the video signal. The intensity of voltage delivered to each individual pixel is increased and the result is a brighter image. If the scope does not feature Manual Gain Adjustment, then the scope utilizes some form of automatic gain that attempts to compensate for different environments of light exposure. Automatic gain is generally acceptable for normal use. There are times however when some users find that an automatic gain setting “over” or “underexposes” an image and Manual Gain gives them the option to adjust for the best image. It should be noted that one side effect of increasing the Manual Gain too much is that the image noise increases (becomes grainy). Most of our Generation 3 tubes are now available in a filmless tube version. Research innovators have now perfected the latest step in night vision technology by removing the ion film barrier within the night vision tube. Previous attempts at removing the film were inaccurately dubbed as “Generation 4” technology by a major company within the industry. In truth, the U.S. military contract was terminated because the process left the tubes too fragile for normal use. Now that the manufacturing process has been perfected, a robust Generation 3, filmless tube is available. The result is a more crisp image with less “halo effect” around bright lights, greater light sensitivity, and generally a greater signal-to-noise ratio. There are four Generations of night vision; however, they are Gen 0-3, not Gen 1-4. Historically, the U.S. Army has defined each Generation of night vision. In the late 90’s the Army did define Gen 4 as the removal of the ion barrier film creating a “filmless” tube. This new advancement was to reduce halos while increasing sensitivity, signal-to-noise ratio (SNR) and resolution, for overall improved performance. While performance was improved, the lack of an ion barrier in Gen 4 tubes led to high failure rates, ultimately leading the U.S. Army to recant the existence of the Gen 4 definition. Now that we’ve seen the latest advances in filmless tube manufacturing, the Army has still not reapplied a “Generation 4” designation. We caution customers to be aware of advertising gimmicks from other companies that label their products as Generation 4 because they’re not being entirely genuine. However, if there truly was an official “Generation 4”, the filmless tubes would receive that rating. Recently, night vision tube manufacturers developed a white phosphor tube which projects in black and white. Gradations of black and white are preferred over the traditional green color by many who report the new white phosphor tubes are less straining to the eyes during extended viewing and users are able to detect a greater range of detail and contrast over green. Customers occasionally report that they find the white phosphor tubes to be less bright initially. After a few minutes however, their eyes adjust and they’re able to see greater contrast. When they look away from the eyepiece, they report less temporary night blindness which is more noticeable with green tubes. An IR Illuminator is an ideal aid for extreme low light conditions. 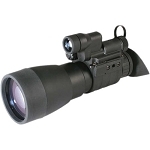 It significantly extends the capabilities of weapon sights, observation devices, and photographic equipment. Infra Red (IR) Illuminators emit an infra-red light that is nearly invisible to the naked eye, but your night vision device can see it. 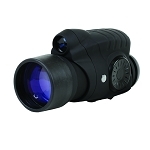 Because the performance of any night vision or low-light CCD device is dependent on ambient light, magnification, atmospheric transparency, and contrast between the target and its background, an addition of the right IR Illuminator can significantly enhance visual acuity and extend detection ranges. Night vision binoculars aren’t as common as goggles, but in many situations are the superior options. Night vision binoculars can deliver a most consistent and easy to see sight picture at a relatively low cost. At least as far as night vision goes. 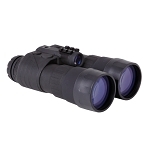 Night vision binoculars are excellent tools to survey and observe for extended periods of time. Most are designed simply with a low magnification to save weight and size. 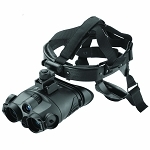 There are night vision binoculars in almost every night vision generation. Night vision goggles are the most dynamic option for night vision devices. They allow hands-free use and provide a wide sight picture for the individual user. Night vision goggles are what most people envision when they talk about night vision. Night vision goggles have two distinct eyecups that offer a wider field of view than monoculars, and greater depth perception. Like binoculars, there are goggles in most night vision generations. Binoculars have a nice advantage when it comes to their ability to magnify an image. Night vision binoculars are nowhere near as powerful as daytime binoculars but offer anywhere from 3 to 6 power magnification. Magnification with night vision gets tricky due to limitations with the technology. Also even though they are lower powered devices night vision binoculars are often already larger than standard night vision goggles. Night vision goggles cannot offer extra magnification due to their inherent design. Magnified goggles would be useless as goggles and simply be binoculars. Binoculars have an advantage if you need to see something at any real distance. Your range of sight is already limited due to night vision, so extra magnification can only help. With a target at an extended range, a pair of goggles may reveal a moving blob of greenish light, but a set of night vision binoculars will allow you to tell if that green blob is a stray dog or a suspicious person. Clarity is more about the generation, the quality of materials and manufacturers of the night vision goggles or night vision binoculars. One is not more intrinsically clearer than another just due to their different designs. This category is a clear tie and cannot be determined without comparing “like” with “like” and allowing the decision to be made on individual product levels. Movements with either system will be easier than movements without. Night vision allows you to see things right in front of you, like holes, large brush, and other potential hazards. Night vision goggles are vastly superior for moving at night, and allow you to safely see where you’re going. Goggles also attach to hands-free systems that allow you to carry extra gear, and better maintain your balance as your tricky terrain, jump across small bodies of water, or if you need to climb. Binoculars do allow you to scout potential routes and identify hazards but are weak at allowing you to see what’s directly in front of you. When it comes to simply observing an area for an extended period for any reason, binoculars are the better choice. They allow you to watch an area from a distance and makes seeing the details of that area easier. Binoculars offer a better sight picture than googles when observing a large area, with the ability to traverse to different distances with ease. Binoculars allow you to also watch for more concealed positions compared to goggles which may force you to be closer than you want to the area you are observing. Regardless of the reason, you are watching an area a set of binoculars is easier to use than a set of goggles. Be it observing animals, or guarding a post. Hunting at night is a controversial and occasionally illegal venture. Always ensure you are within your state’s hunting laws. However, with that said, night vision goggles do allow you to use and carry a firearm. 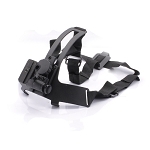 The hands-free nature of night vision goggles makes them much easier to use when hunting. 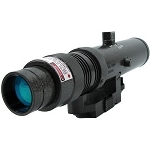 Night vision goggles, when paired with an IR laser on a firearm, is also an accurate way to engage your game of choice. Night vision binoculars would make spotting and watching animals easier, but they would make it more difficult to shoot them. Off the bat, it’s very easy to assume goggles are the best tactical choice. They make carrying a weapon and moving possible. However, you have to examine the tactical situation. In a dynamic and flowing situation like an airsoft CQB match, a set of goggles is the superior choice. It allows easy movement, easy shooting, and a hand’s free experience. However, on the other side of the tactical hand, not all situations are fast moving and dynamic. A police officer surveilling an objective is way better suited with a pair of binoculars that allow him to park a good ways away. How to determine the two will be easy. Look at the needs you have and identify which product works well for you. At the end of the day, it’s going to boil down to the objective at hand and what you’ll be doing.